The final open for the series took place at Datchet on 15/16 October. Those who studied the weather forecasts and decided not to come got it right. Saturday was a beautiful sunny day but sadly just enough wind to allow a trickle round for the first race; and the wind failed entirely at the end of the second. On Sunday, we had thick fog. After several cups of coffee we gave up, distributed prizes and went home. As usual, no-one qualified for the open fleet. The silver prize was won by Alex and Mike Tatlow in 3288 from South Cerney. The classic prize went to Tony Oatley and Tim Greaves in 2801 also from South Cerney. No, 2801 is not an error. The boat is one of those numbered above 2700 and subsequently classified as a true classic. Congratulations to both and to South Cerney. It seems that fewer ffs travelled this year than last and the STS suffered from the same problem. Three races to qualify and too few qualifiers – indeed the two winners were the only qualifiers. Determined regulars from previous years sailed two events only. The obvious solution is to ask for two races to qualify. If we do that it is quite possible that a classic from, for example, Llangorse and another from Broxbourne could win two races each without sailing against each other! Something similar could apply to the silver fleet. I mistakenly thought the STS was starting at Cardiff Bay – ha !! In fact it boots up at Llangorse a week earlier!! Registration will be from 10am Saturday 21ST First Race 13:30 and continues on Sunday 22nd in the morning. Prizes and afternoon tea and cakes on the lawn at 14.00hrs Sunday 22nd. Entry forms in advance or on the day at the club. Further details please contact David Moore on 07808688350. Why was it launched? What is it for? Is it doing anything constructive? Should you take part? BIFFA organises a range of events for the enthusiastic travellers – mostly top 50 sailors who are usually owners of competitive or up to the minute boats, attending qualifiers, nationals, internationals. Inevitably, they gather at clubs with big water. A few years ago, it became clear that there was a need to provide inter-club racing for clubs with smaller ff fleets and, particularly, smaller sailing areas. Many such clubs have significant numbers of classic and some silver boats few of which support the major events. My view is that a divide was slowly developing between the top 50 most competitive enthusiasts and the rest of the ff community. There seemed to be a need to provide opportunities for a wider group of ff sailors at many clubs to meet, compete, talk and contribute to the development of the British ff fleet in toto. As it happens, quite by chance, this coincides with important proposals to develop the rig, offer new sail materials and update the class “image”. The more we talk about these, within and between clubs the better. The more we travel, the more we talk and recognise common interests and the more cohesive the ff community will become. The first response came in the midlands – the TNT series organised by Mike McKee and Chris Swallow. 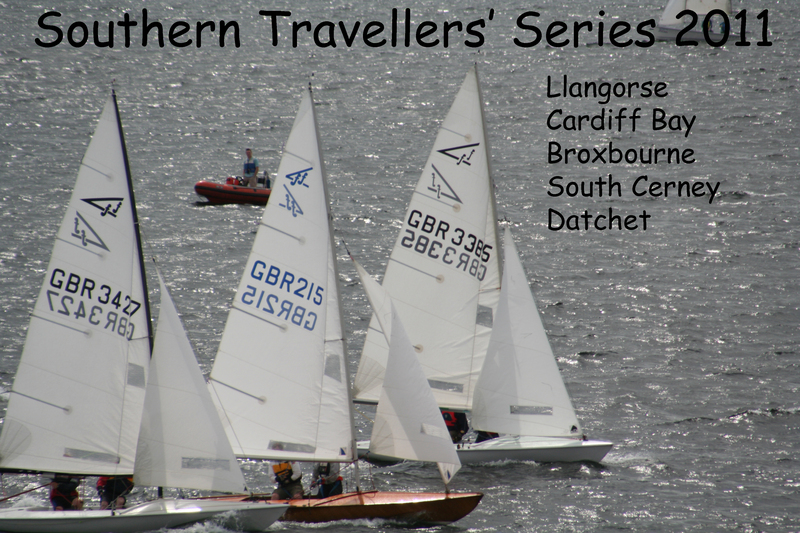 Two years later, we launched the Southern Travellers Series (STS) currently managed from Datchet and a third Series has been launched in Scotland. The STS began two years ago. The initial idea was to involve small and medium sized inland clubs, particularly those with classic and silver boats. For practical travel reasons there needs to be a fast link between the clubs. The M4 seemed to be OK so for the first two years the clubs were Bewl, Broxbourne, Datchet, South Cerney, Cardiff Bay and Llangorse. Six events; three to count and the national top fifteen ranked boats were excluded from the results (though not of course from the events). The two years yielded some clear messages. Bewl members are less enthusiastic about the idea; secondly, no modern boats qualified. Thirdly, the enthusiasts were the classics, several qualifiers and a few silvers also qualified. The objective is to bring ff sailors together; I conclude that most of the modern boat travellers attend the major opens – so they are involved elsewhere. So the STS can focus more accurately on classics and silvers; and then, what about qualifying? Five events and three to count? Or two to count? The target is to encourage ffs to travel and get together. I am inclined therefore to stick with three to count and hope (and exhort!) owners will respond. Returning now to the questions in the title – have I answered the first three and will you take part?